Flushing, Queens, New York is known for a lot of things. The New York Mets. The U.S. Open tennis tournament. One of the most diverse populations in the country, with particularly large Chinese & Korean communities (and with those, amazing food). The Nanny. The World’s Fair. That clip of Homer Simpson seeing a bus heading to “Flushing Meadows” and picturing a field full of toilets. My birthplace. One thing Flushing is not known for is craft beer. However, that’s all changing, thanks to one bar & brewery. 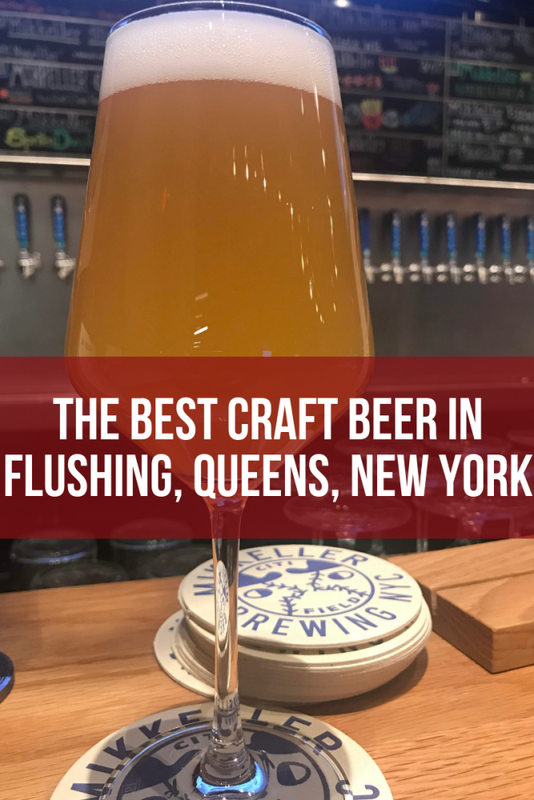 Here’s the best craft beer in Flushing. Okay, it’s pretty much the only craft beer in Flushing. But as you’re about to see, that’s quite alright. For years, Denmark’s Mikkeller Brewing was known as a nomadic brewer. 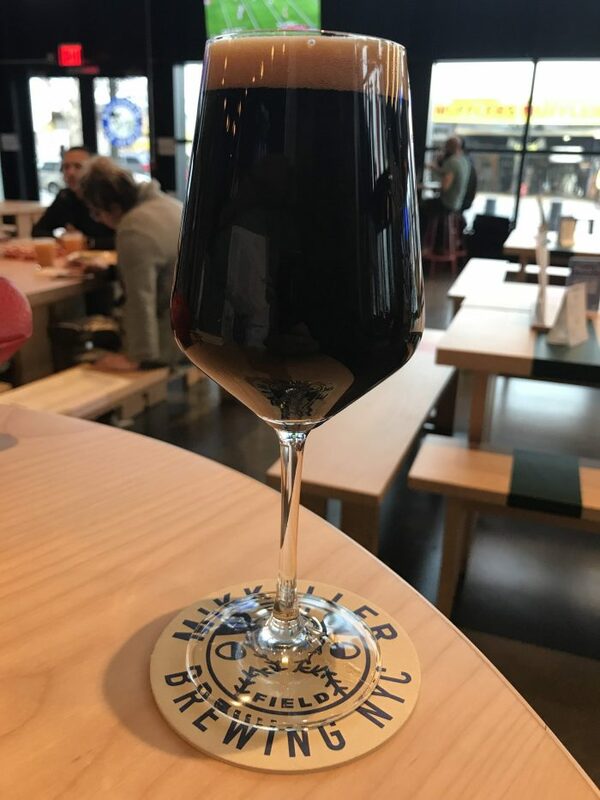 The brewery, founded by Mikkel Borg Bjergsø, had several beer bars around the world, including several in Copenhagen that I have visited, but they owned no brewery themselves. This has changed recently. 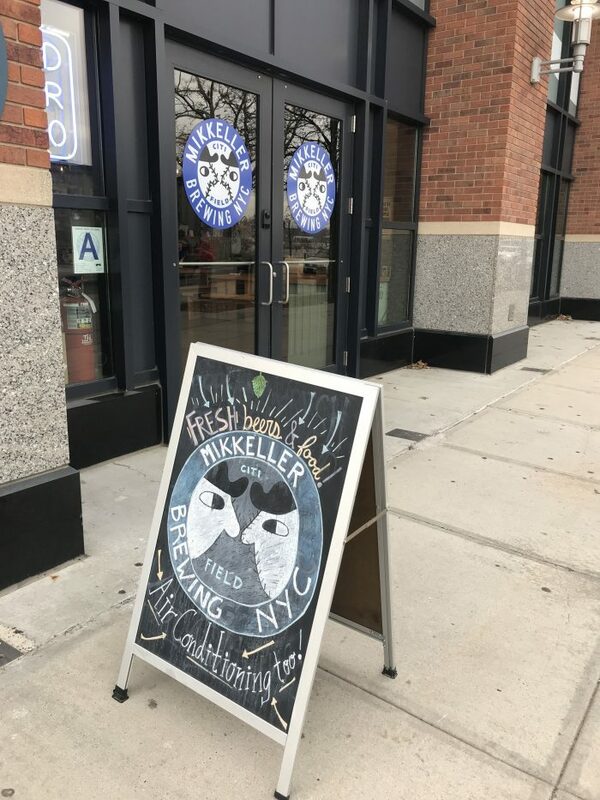 First, Mikkeller opened a U.S. brewery in San Diego, and in March 2018, they opened a brewery in Flushing at Citi Field, home of the Mets. While Mikkeller Brewing NYC is at Citi Field, you don’t need a ticket to get in. 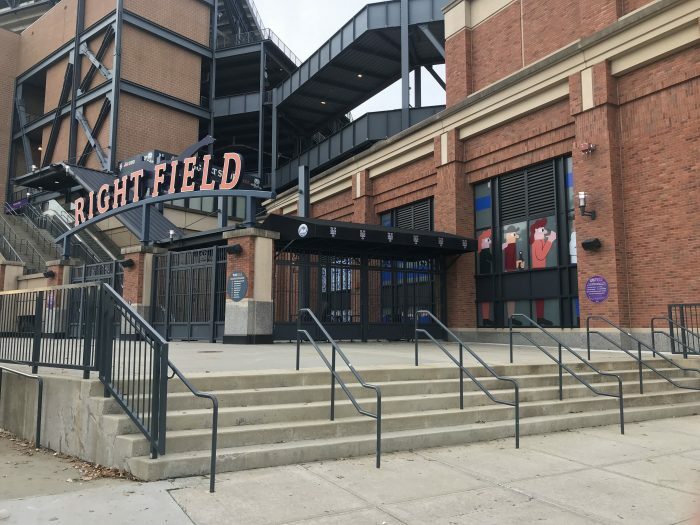 The bar & brewery are located in the right field corner of the stadium, but are accessed from a separate entrance (and in fact, you can’t see any of the games from inside). Most likely, you’ll be arriving on the 7 Line. Take it to Mets/Willets Point, then follow the signs for Citi Field. You’ll see the old home run apple in front of you, then keep heading to your right along the outside of the stadium. You’ll know you’re at Mikkeller when you see the chop shops across the street. Upon entering Mikkeller Brewing NYC, it’s immediately clear to anyone familiar with the brewery’s art that you are in a Mikkeller Bar. 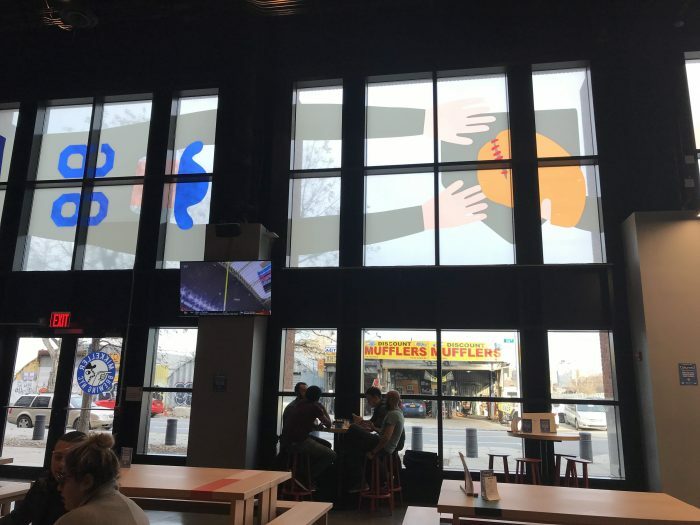 Artist Keith Shore, who has designed all of Mikkeller’s labels & bar art, also designed the logo & murals for Mikkeller Brewing NYC, taking inspiration from their location at Citi Field. Mikkeller Brewing NYC is spacious. On game days it is packed, but when I visited on a Saturday in early December, the bar was quietly abuzz. There are several large tables for groups to sit at (or for people to share & bond at while ranting about the Mets), plus there’s also plenty of bar seating. And as far as beer, well, Mikkeller Brewing NYC has a ton of it. 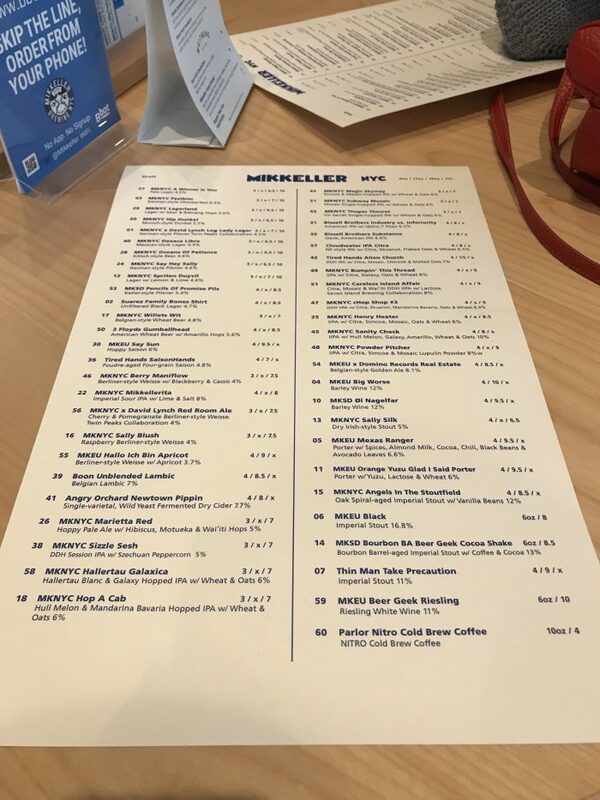 There are 60 taps total, the majority of which are Mikkeller’s own beers, but there are also a few guest beers from around the world. If you can’t find a beer you want to drink here, then you don’t like beer. If that’s the case, wine & spirits are available. 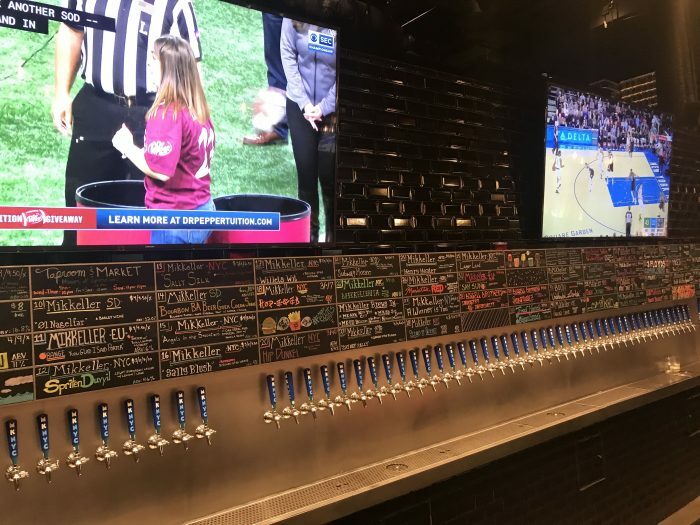 With so many taps to choose from, it’s also helpful that the bar offers anything in a 4oz pour, so you can try to get through as many brews as you’d like if that’s your thing. 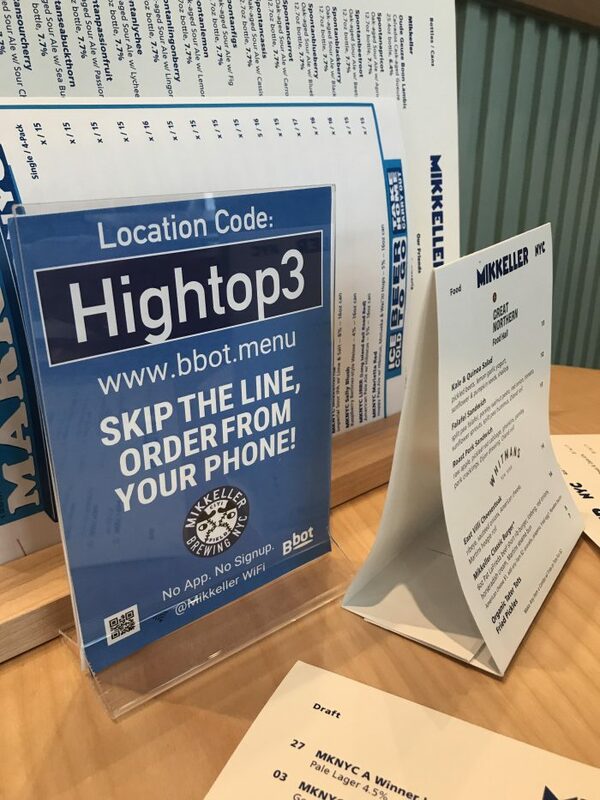 For the expedience of time, you can order each round through your phone. It’s an interesting idea, although I noticed that not all available beers had been updated in it, nor were 4oz pours available. 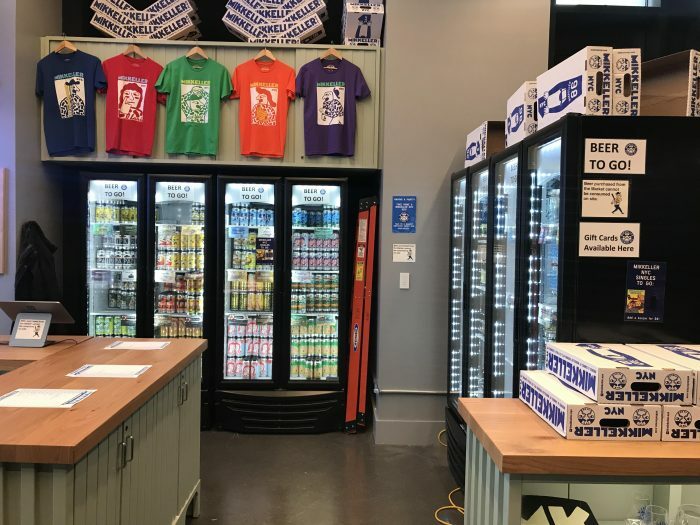 It makes sense that they don’t want bar staff to have to run out to a table to bring 4oz pours over-and-over again, but it’s something to keep in mind if you’re planning on sampling. 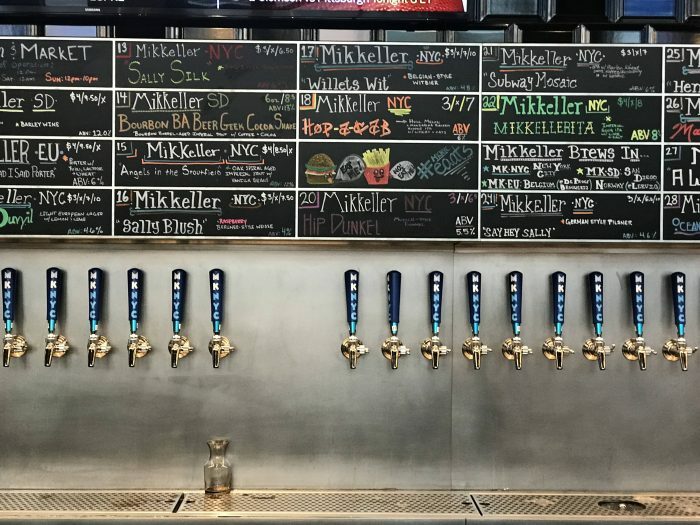 The food menu at Mikkeller NYC is an eclectic mix from well-known restaurants around the city. 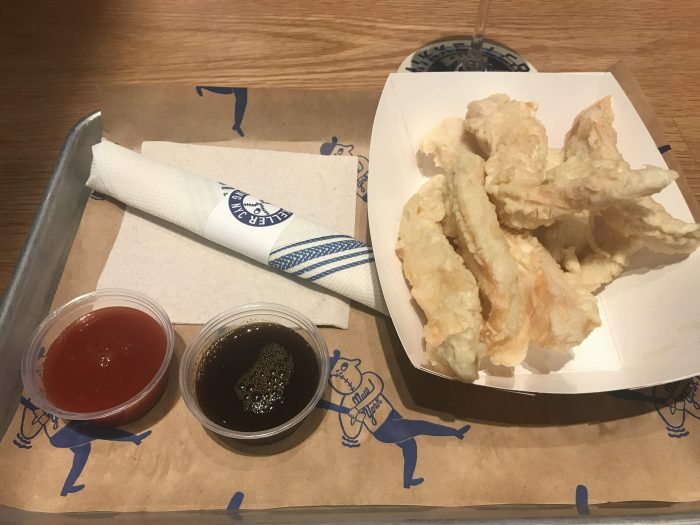 Food ranges from classic bar food to Korean (which if you’ve ever been to South Korea, is classic bar food) from places such as Great Northern Food Hall, Unidentified Flying Chickens, Whitmans New York, and Pat LaFrieda Meat Purveyors. The music playing at Mikkeller was pretty close to perfect, given the location. The music was a mix from the 60s & 70s, with plenty from The Beatles, who of course played at Shea Stadium, as did Elton John & local favorite Billy Joel. At one point I thought that all the music was from people who had played shows at Shea, but then there were some songs that to my knowledge didn’t fit that requirement. At any rate, it was a good fun mix that fit the vibe of the bar & tied it to Flushing in yet another way. 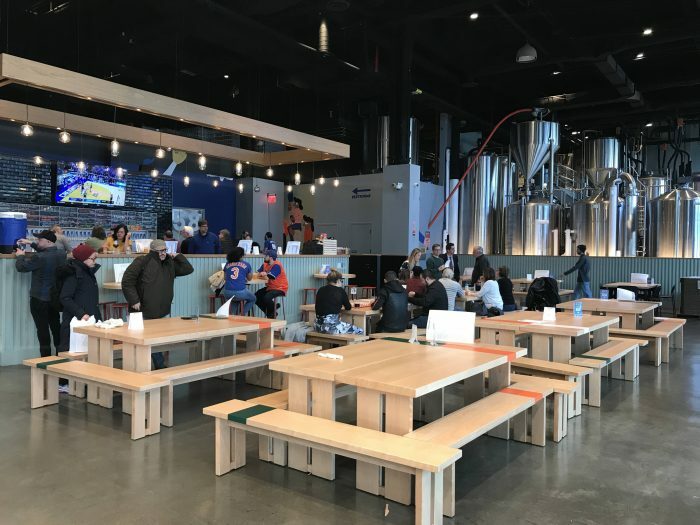 While Mikkeller Brewing NYC is a great place to pre-game before going to a Mets game in Flushing, I imagine it also must be a nice destination for Mets fans to hang out during road games as well. The bar is filled with large TVs, making it a great sports bar no matter who is playing. When I was there, plenty of people were watching the games, but nobody was obnoxiously cheering anything, as most everyone was there for the beer. There’s also a selection of bottles & cans that are available to go, along with merchandise. You can even have Mikkeller beer delivered around New York City. 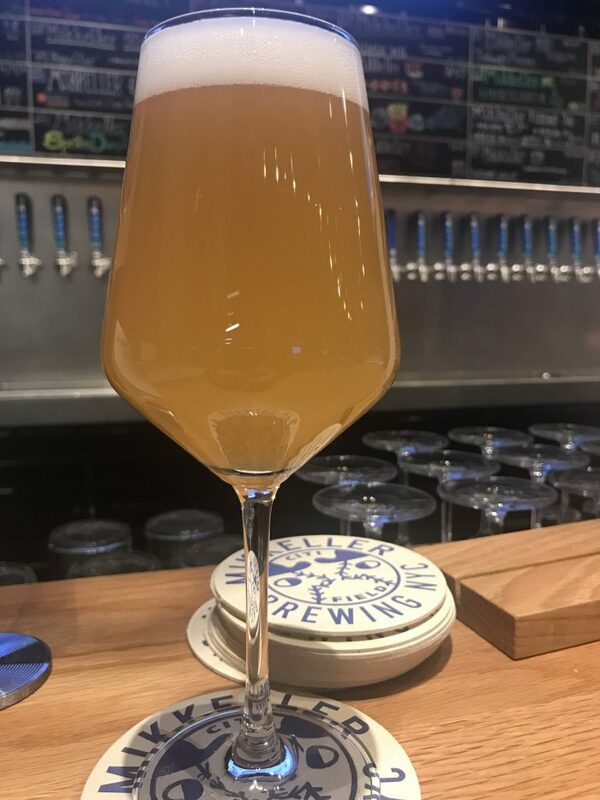 Mikkeller Brewing NYC is alone worth venturing out to Queens to spend some quality time with beer, but if you want a larger selection of craft beer bars & breweries, Long Island City is just down the 7 toward Manhattan. But with Mikkeller, Flushing finally has great craft beer, even if it’s just one amazing bar.